Estee Lauder's Pure Color Love Lipsticks came out earlier this year. Despite having "Pure Color" in the name, the packaging and look seemed to be a departure from the Pure Color Envy Sculpting Lipsticks - see review here and here. I picked up three after falling in love with the shades in-store. There are different sets in this range - Matte, Pearl, Chrome/Foil, and Creme. I only picked the creme ones; you get enough matte from liquid lipsticks, and I like my bullets lippies to be hydrating when I touch-up. There are 30 shades in the range, and there's something for everyone, from the subtlest of neutrals to the vampiest and boldest lippies. 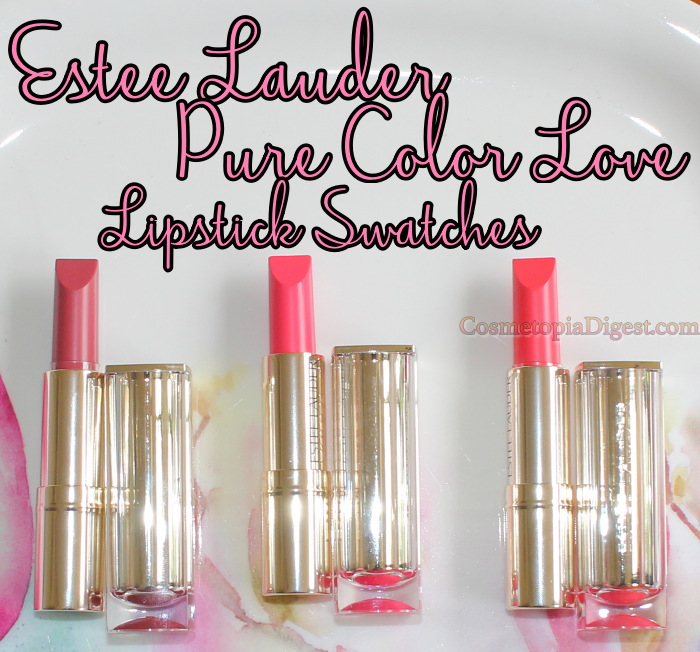 Scroll down for the review, swatches, and demo of the Estee Lauder Pure Color Love Lipsticks. 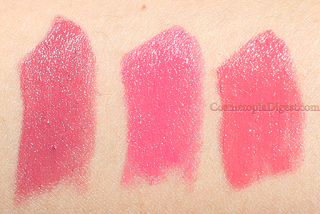 Please watch the video for live demos and swatches, and my thoughts on these lipsticks. Do give me a thumbs-up, and please do subscribe for more updates. Big love. The new kinda bullet helps me achieve better precision despite being a klutz. I love the wear-time and the creamy feel, and the coverage. The formula reminds me of the Lancome Rouge In Love - review here - which was a range of hydrating but pigmented bullet lipsticks that stayed on for five-six hours easily. I don't see the Rouge in Loves around at the Lancome counter anymore - they only have the far less-wearing Color Designs these days. The Estee Lauder Pure Color Love Lipsticks cost £19 or $22. With 30 shades and four different finishes, you're very likely to find something you love here. Buy the Estee Lauder Pure Color Love Lipsticks here - they ship worldwide. If you are in the US, you can get yours here.